This is a slide show of our many rescues from all over Ireland. Unfortunately we cant put all the rescues on our website, we might break the internet! Enjoy the ones we have shared with you and don't forget we have a Facebook page as well, just search for The Hogsprickle. We would love to say a special thank you to Ennis Mens Shed for building us our fabby new flight, which will really help us in rehabilitating the birds and fledgling that come into our care. This poor guy was found well and truly stuck. 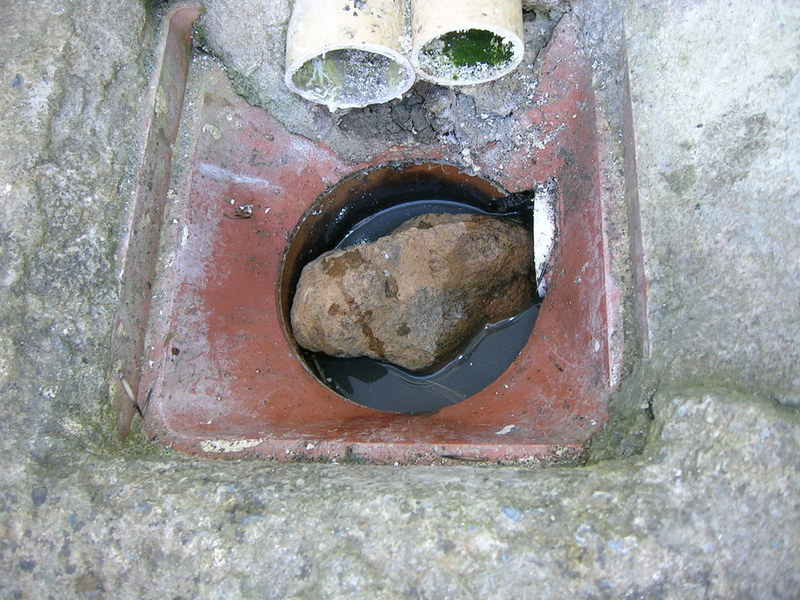 The owners of the house in Croom, Co Limerick had come home from holiday and the next morning had found this guy stuck in a drain outside the back door. Lucky for the hog they had come home! He was relaxed enough to fall in but the second he was touched he would roll up and stick out his spines making him well and truly wedged. After a struggle of around an hour we managed, with the aid of 2 wire coat hangers, to pop this guy out. It was like getting a cork out of a bottle and I may have heard a pop when he came out! We added a few rocks to the drain as an emergency plug till the owner can replace the broken drain cover. 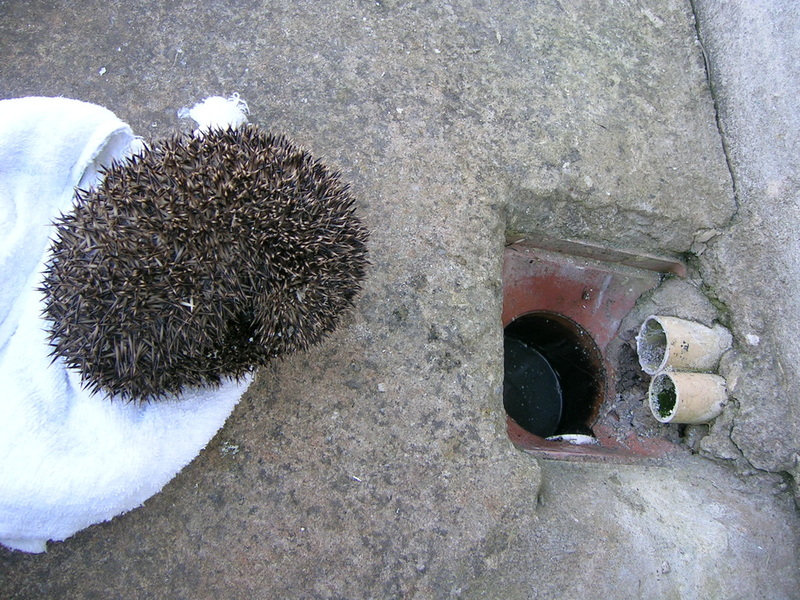 He had been half submerged in the drain water and when he rolled his head had gone under the water. There was also a few flies around him so we were concerned about fly strike. So he came back to the Hogsprickle for a little B&B on us and and free health check. We are happy to say say he is well and eating like....well like a hog! 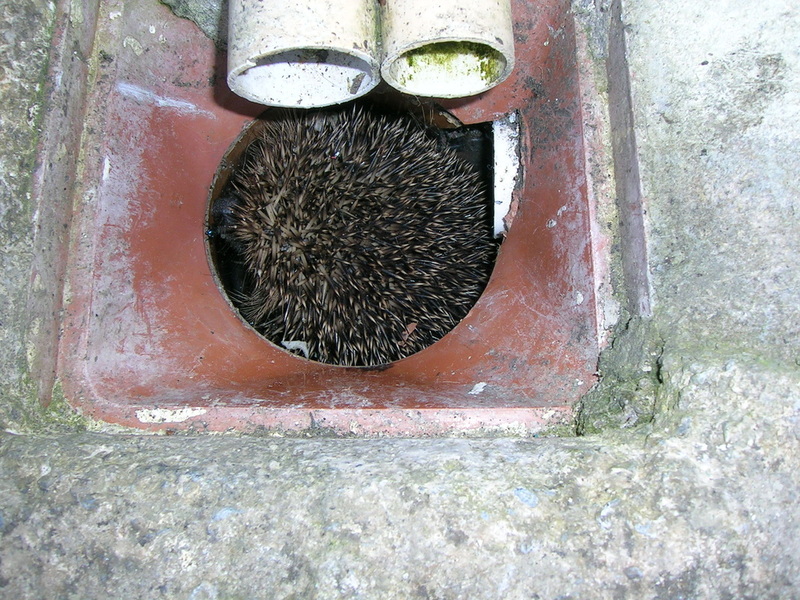 So he is off to join his wild buddies far from any open drains. 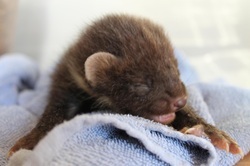 Taz came in with 2 brothers when they were only a week old, after her mum had been found as a road casualty. Unfortunately her brothers were weak and sadly we lost them but this little lady was a fighter. and she got stronger and stronger until at the age of 12 weeks we decided she was wild enough to start her journey back to the wild. Our friends at Kildare Animal Foundation Wildlife Unit took her to be with a Kitt they had and they both started the process of being soft released back to the wild. Live long and prosper wild thing! This lucky Mum was found in a hay loft whilst her rescuer was moving hay to feed her horses. It was a real pleasure to see the whole family prosper. This is Blind Harry. 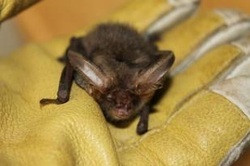 Poor Harry had been found by Lola and her little brother Ben and her Mum and Dad. Lola went to the Vet with her Mum and Dad to have wounds on his face looked at. The Vet thought that he had been attacked by a dog and the result of the attack had left poor Harry missing one eye with the other badly damaged. The Vet gave Harry pain relief and antibiotics for the infection. Lola and Ben helped their parents looked after Harry till he was much better. Lola was very upset to part with her friend but we explained that Harry was going to live with another blind hedgehog who needed a friend of his own. Harry will be in a large walled garden where he can roam and hunt his food without fear of roads or dogs. Hedgehogs have really bad eyesight anyway and rely on their nose and ears to find food. They can even hear worms underground! So thank you to Lola and her lovely family! (this was the best photo we could get, Harry hated to be lifted and the second he was put on the ground he legged it!). 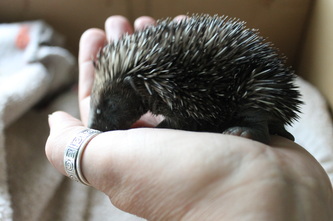 Killaloe was a young hedgehog who was found by lovely people in Killaloe. 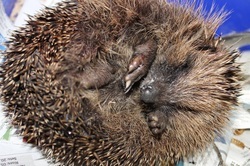 Poor hog was found lying on his side on the lawn and taken to a Vet who gave initial treatment. Killaloe stayed with his rescuers for a week till they phoned us and we gladly took him into the Hogsprickle. Killaloe was then treated with medication to help with inflammation and lots of pain relief too, He got fat and regained the use of his legs through a daily swim (in my bath! ) and a run in one of our pens in the early evening. Killaloe went wild with Benson and Hedges and we hope perhaps he may meet up with Benson in the spring and become a Dad. This little guy was a bit worse for wear when a storm grounded him. A few days later he was as right as rain and flew off on a still night released where he was found. 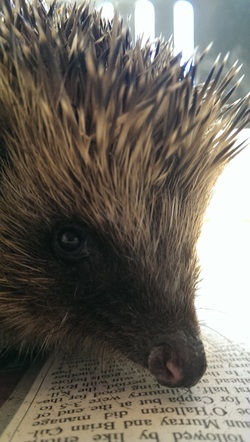 Bramble had over wintered with us as she was a juvenile and underwieght for hibernation. She stared in Elev8 on RTE and has quite a fan base! 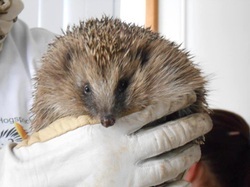 She appeared a few times in public to help people understand how to handle and help hogs and now we are delighted to say she has earned her right to go wild. Live long and have lots of babies Bramble. 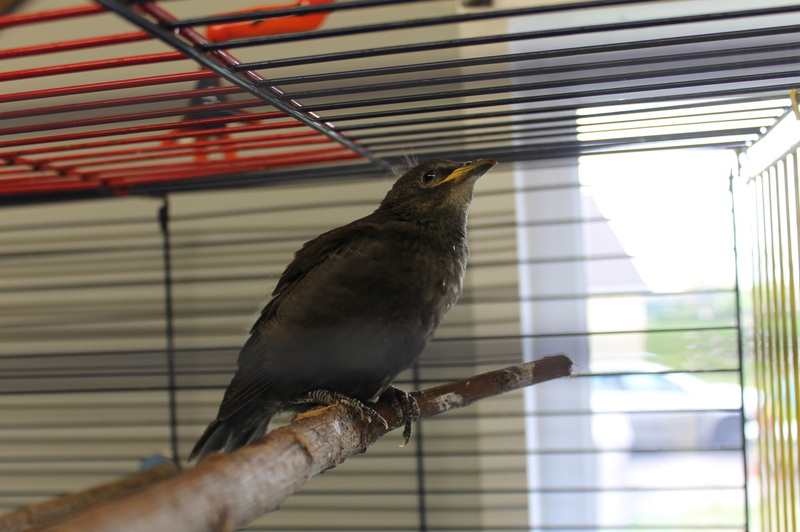 This little bird came to us from a very kind lady who had picked him up after he had fallen out of his nest. She fed him for a few day till his feathers started to appear and then brought him to us. He is growing fast and hopefully will be flying off on his own into the wild in a week or two. 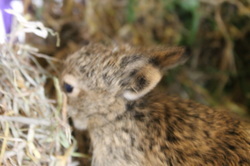 This baby Hare called a Leveret was found and brought into us by a man who found him in his garden. Usually we advise to leave them alone as Mum will come back to feed them but the man had 2 cats and a terrorist terrier. If you find a baby hare or Rabbit (called a kitten) please leave them alone, unless in danger from predators. 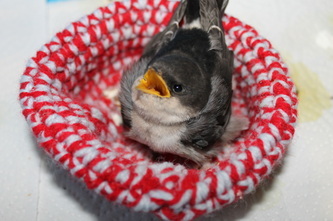 Just like fledgling birds their parents are looking after them and they make better wildlife parents than we do! 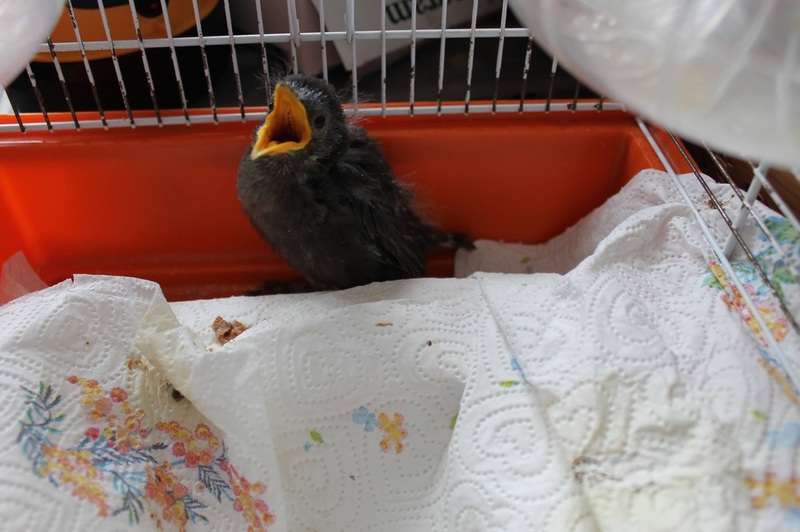 This poor baby had fallen from his nest 25feet up in a tree. The an who found him couldn't get him into the nest and took him to Vet for a check up. He had had him too long and we decided to take him as his Mum probably wouldnt have accepted him back into the nest. 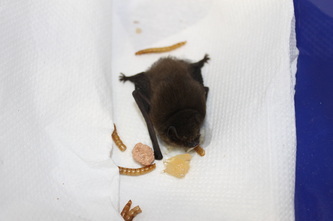 We bottle fed him for a few days before our friends at the Kildare Wildlife Unit took him to raise him with some others they had. This guy was covered in fleas!! We have never seen so many on a baby and we had concerns about anemia due to blood loss. After a warm up and a few meals we hear he is growing fast and starting to use his teeth! 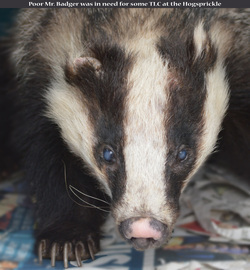 Poor old badger had been found by a kind lady in her shed. She noticed something was wrong when her cats were all in the one bed and when she looked harder Badger was there. This old man had been thrown out of his set and was blind, deaf, had been beaten up and his ears had been chewed. This happens with old badgers and as he was old and sick we had to take him to the Vet for a humane goodbye. Such a beautiful creature. Our little Kingfisher was captured and brought home by his rescuers cat! Thankfully she got him and called us. After some TLC and a couple of night B&B off he went to his own stretch of river bank where other Kingfishers had been spotted so we knew there was a good clean menu for him. This little girl had a fight with a ladys dog (who came off worse though and had to have some spine pulled out by the vet) Dont mess with the spiky balls. 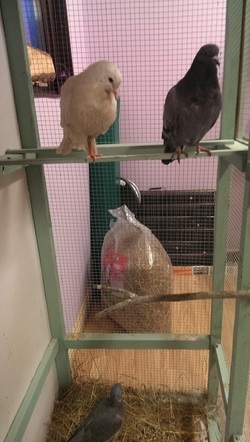 Curly (on the bottom) Larry the pigeon and Mo the Dove all came in around the same time with broken legs and a broken wing between them. Mmmmm whats on the menu for today? This little boy came all the way from Cork, found out and wandering in the day time. He was very lethargic and dehydrated but he soon perked up when we warmed him up and gave him a good feed. He is now off into the wild to make babies.